The Ultimate Camping food list, will help you to figure out what food you should bring camping, particularly car camping. You don’t want to spend your entire camping time cooking, so easy to cook foods are ideal. If you’re going interior camping, find out what backpacking food to bring. · S’more stuff – Graham crackers, marshmallows, chocolate squares. · Hot dogs and buns (to roast over the campfire). · Burgers and Buns – buy the burgers frozen, so they keep your cooler cool for a few days. · Condiments- ketchup, mayonnaise, mustard, relish, cheese, lettuce, tomato. · Baked Potato (don’t forget aluminum foil- and DON’T leave the foil in the fire to burn, it doesn’t actually burn away). · Trail Mix / GORP – Gold Ol’ Raisons and Peanuts (or Granola, Oatmeal, Raisons and Peanuts). · Apples – great snacking item for a day hike. · Bagels (they don’t smushed) with Bacon, Tomato, Lettuce. · Peanut Butter and Jam- great for breakfast, or Lunch. · Meat Pates – easy and tasty lunches. · Salami or pepperoni or pepperoni sticks (that don’t need refrigeration). · Cup O’ soup, Soupworks or cans of soup - a ready made meal! · Coffee- instant isn’t perfect, but it’s easy. · Cereal- my mom used to buy the individual cardboard packs, and we’d eat out of the pack for breakfast (less garbage). Plus, it was the only time that I got ‘Fruit Loops’ as a kid! · Pre-packaged hot cereals- ‘just add boiling water’. · Instant ‘Side Kicks’- another easy meal. · Spaghetti – can or jar of spaghetti plus noodles. · Bagels with cream cheese and cucumber. Remember, if you’re going drive-in camping, you’ll have a cooler, and so can bring most things that you would use at your home. The list above is a list of easy, yet yummy foods that appeal to the average North American Camper. It is by no means complete, and I will be adding more ideas as I think of them. 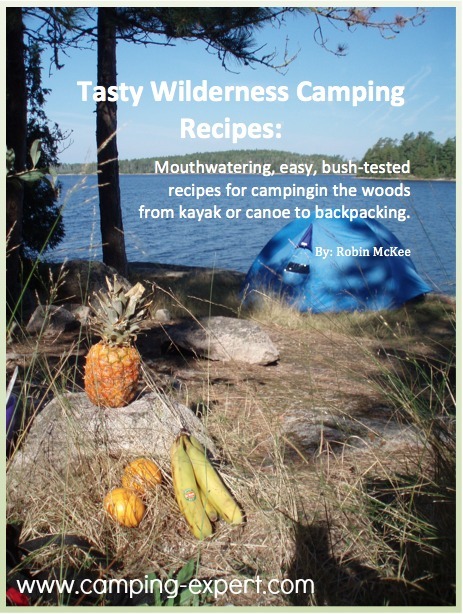 If you're interested in Backpacking , canoe or wilderness camping, check out the ebook that I wrote from years of experience in the woods.